"Have No Fear, My Good Friend"
Lower left, in black ink: "JM. moreau le jeune. 1775"
Markings: On mount, at bottom right corner, unidentified collection mark stamped twice. On frame backing: Labels from 1932 and 1968 Royal Academy of Arts exhibitions. On frame backing: Label with typewritten text: "Bought at the Lepke sale of the collection of King Louis II of Bavaria in Berlin in 1893 [sic] by Baron Edmond de Rothschild who ceded the "Declaration de la Grossesse" and the "N'ayez pa peur mon bonne amie" to his English cousin Lord Cararvon, and the "Pari Gagné" and the "Accord Parfait" to his German cousin the Baroness Goldschmidt-Rothschild (see Vol. IV of the Widener Catalogue on the subject of the "Monument du Costume") The first two bought by the Honble. Irwin Laughlin from the Carnarvon Collection through Messrs. Agnews in London in 1916 and the second two bought by him at auction in Berlin in 1931." Pregnant with her first child and apprehensive, a young woman reclines on a daybed in a mirrored alcove. Facing her across the couch, her friend leans forward and reassures her: "The moment [the birth] is over, you won't give it a thought. . . . I have had four children and am none the worse for it." The standing priest bolsters her with the words that form the drawing's title: "Have no fear, my good friend!" Jean-Michel Moreau le jeune made this drawing as a finished study for an engraving in the celebrated series Monument du costume of 1776. With a plot loosely structured around the childhood and early marriage of a young man, Moreau depicted a variety of events and illustrated the most fashionable clothing to wear for each. 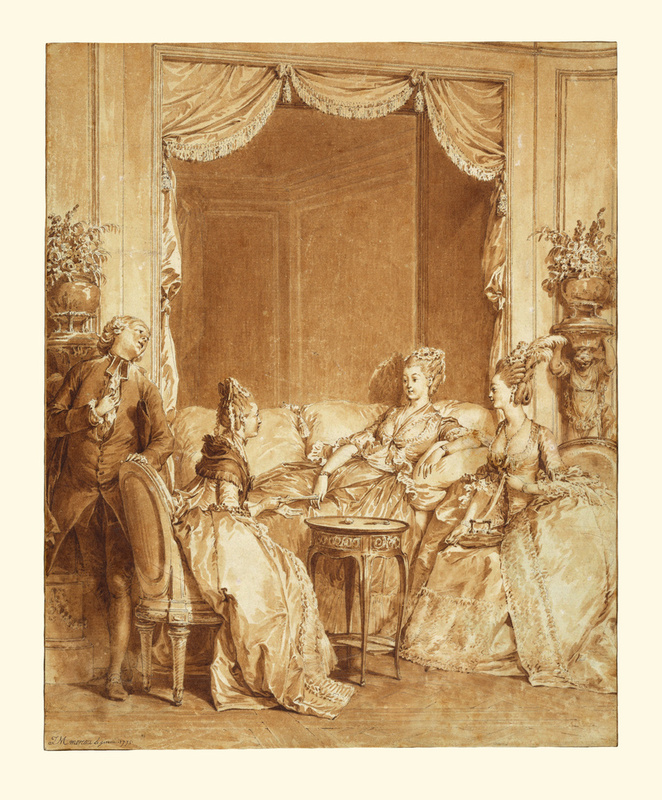 The series reflects the social and moral behavior of the 1700s, but it also forms a vivid record of contemporary taste. The elegantly cut garments, ornate hairstyles, opulent textiles, delicate flowers, and expensive furniture and porcelain reflect the wealth and position of this social circle. Moreau's precise drawing style, focused on brilliantly rendered details and great delicacy of handling, suited both the domestic theme and its setting. Baron Edmond James de Rothschild, Austrian, 1845 - 1934 (Paris, France), by gift to the Earl of Carnarvon. Irwin Laughlin, American, 1871 - 1941, by inheritance to his daughter, Gertrude Laughlin.